This article was originally published on Business in Vancouver and was written by Tyler Orton. Ask the CEO of Microsoft about the innovations coming out of Vancouver and the word “monumental” is one of the first words to spring out of his mouth. “I’m very, very excited about the work that we’re doing in Vancouver,” Satya Nadella told a packed ballroom Tuesday (September 20) while speaking at the Emerging Cascadia Innovation Corridor Conference in downtown Vancouver. 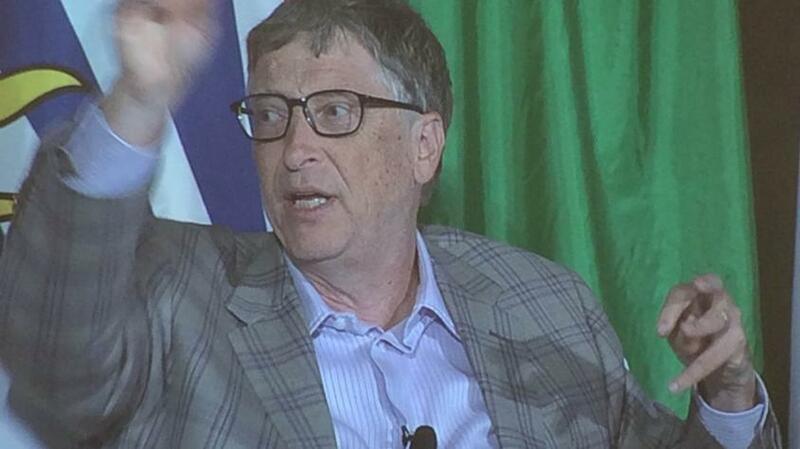 Sitting next to him throughout an informal lunchtime chat was Microsoft co-founder, Bill Gates. For most of 30 minutes, Gates and Nadella kept their conversation focused on corporate culture and how partnerships between the private sector and universities sustain each other when innovating. But Gates did take time to throw his support behind an announcement from earlier in the day, when the governments of B.C. and Washington agreed to collaborate on a “tech corridor” intended to create more economic opportunities between the regions’ tech sectors. “Washington-British Columbia is a really good opportunity but Canada as a whole can be an exemplar of the values and investments that will drive innovation and help us all,” said Gates, who had visited Montreal a week earlier where Prime Minister Justin Trudeau had been speaking. Gates said that trip convinced him Canada had the leadership and “good immigration policies” he feels are lacking in other countries looking to kick-start their innovation sectors. Nadella, meanwhile, cited the city’s gaming sector and local efforts to develop apps for Microsoft’s augmented reality headset, the HoloLens, as two examples of Vancouver leading the way. “It’s the human capital of this region that is going to make a monumental impact in terms of what Microsoft is producing,” Nadella said. Microsoft-owned gaming studio The Coalition has about 200 employees working in Vancouver. Meanwhile, Finger Food Studios is one of only eight global agencies Microsoft selected for a special program aimed at developing apps for the HoloLens. The Port Coquitlam-based company is leasing a 26,000-square-foot facility to help it develop massive holograms for Microsoft. CEO Ryan Peterson told Business In Vancouver he was thrilled to hear Nadella give his company a shout-out and he would be meeting with Microsoft bigwigs following the Cascadia conference to discuss Finger Food Studios’ holographic innovations. Nadella also said Microsoft would like to build a similarly tight relationship with the University of B.C. as it shares with the University of Washington. “This dialogue that this conference represents is great time, it’s great for us and it’s great for the region,” he said.